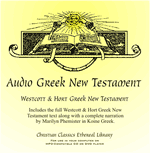 The Audio Greek New Testament contains narration of the entire Westcott & Hort Greek New Testament in Koine Greek, in one MP3 collection. The entire text of the Westcott & Hort Greek New Testament is also included for on-screen viewing in a Web browser. Marilyn Phemister, the narrator, is a former elementary school teacher and graduate of Wheaton College (Illinois) with an advanced degree from UCLA. She is a self-taught student of Greek and recorded the Greek New Testament when threatened with the loss of her sight. The pronunciation is similar to that taught in most standard college and seminary texts. You can listen to a sample. Your purchase of this item helps fund the further development of the Christian Classics Ethereal Library. Compatibility: MP3 files can be played on Microsoft Windows, Macintosh, Linux, or any mainstream MP3 player. To view the included print text of the Westcott & Hort New Testament on a computer, a Web browser such as Internet Explorer or Firefox is required.